COVER OF THE MONTH: ALEX GARNER - ANNIHILATORS #3 (OF 4) Dire Wraiths are pesky blighters. Sure the Silver Surfer could just open his hands and fry the critter with a little power cosmic, but that would defeat the drama of the piece! Is any one else picturing being in the dentist chair and the drill coming closer? Dentist or Dire Wraith - now there's a choice worthy of the Surfer! CLOSE CONTENDERS: Marko Djurdjevic - Fear Itself: Home Front #2 (of 7) (What can I say? I'm a sucker for anything New Warriors related! 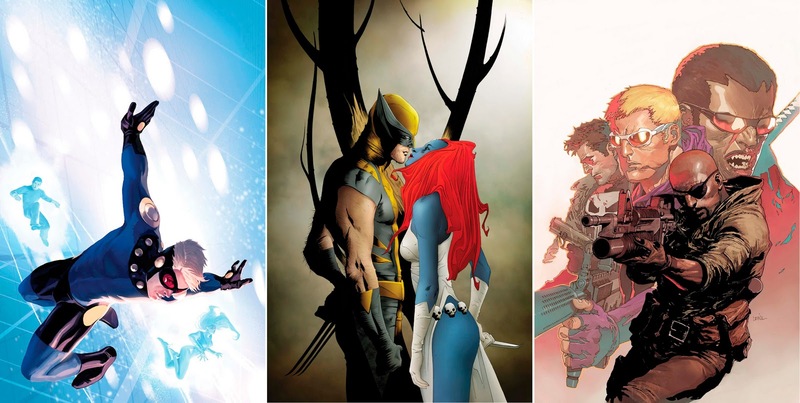 ), Jae Lee - Wolverine #9, and Lenil Yu - Ultimate Comics Avengers vs. New Ultimates #4 (of 6). Marvel over Marvel's full May line-up after the jump. that is one wicked cover!!! can't wait for this series to hit the stands. i'm going to be blowing up the ROM blog with what i get from that series. Glad you guys liked the cover pics! Dire Wraiths and the Surfer - retro Marvel is definitely best! Oh wicked man! Ouch. I'll be rubbing my forehead for awhile. The colors in that piece are really great, too. Haha - and that I think is the coolest comment IADW has ever received!